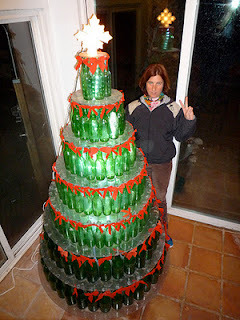 More sparkling wine is purchased during this time of year than any other. Popping the cork on New Year's Eve is a well established tradition. Thanks to the American Chemical Society's Bytesize Science video series﻿ we now know the bubbles that give Champagne its pop are just following Henry's Law. The video notes that more than 600 different chemical compounds join carbon dioxide in sparkling wine, helping to create the aroma and flavor. Quoting a study published in the Journal of Agricultural and Food Chemistry, the video also suggests the best way to pour a glass of Champagne to maximize the sensory experience is at an angle to retain up to twice as much carbon dioxide in the wine when compared to pouring down the middle of the glass. Tuesday Tasting is a regular feature of Lyke2Drink that explores some of the best beers, wines and spirits on the market. This week we sample a pair of smoked beers. Smoked beers are fairly rare finds. You know you have found a great beer bar or retailer that stocks smoked beer. A recent trip to Bamberg, Germany, reminded me of just how much I enjoy these beers. Rauchbier is not for every day or for every one. But when the time is right, these are flavorful beers that satisfy a unique taste spectrum. The myth about smoked beers is that they are heavy. The reality is that these beers can be delicate. While they are full of flavor, smoked beers don't need to be overwhelming. If you have not tried rauchbier, my suggestion is to ease into it and not make a smoked beer your first beer of the day. There is nothing to be afraid of with these beers, but they do tend to challenge your concept of what a beer should taste like. You don't want to follow up a Miller Lite with a Schlenkerla Urbock. You may want to have a roasty stout or porter before you crack open your first smoked beer. Others beers that present solid flavor profiles, such as a hoppy IPA or malty bock, can also serve to get you in the right mindset for your first-ever smoked beer. The flavors in these beers are no more intense, just different. Smoked beer is a taste of history, taking you back in time to when malt was dried with the help of open fires. 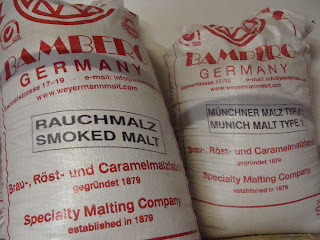 If you like peaty Scotch or enjoy smoked meats, rauchbier will be at once familiar and also different. Trying new drinks is all about the adventure and having a willingness to maintain an open mind. Remember as you try these beers that in many parts of the world prior to the industrial revolution almost all beer was smoked beer. Heading into the Christmas season I visited several of my favorite retailers looking for holiday beers and specialties to share with family and friends. At the grapevine Wine Shop and Wine Bar in Fort Mill, S.C., I discovered Victory Otto Ale. At Total Wine & More, Aecht Schlenkerla Eiche, a doppelbock brewed for the holidays, was on the shelf. Even though I have enjoyed many beers from Victory and Schlenkerla over the years, this is my first encounter with either of these beers. Aecht Schlenkerla Eiche: Schenkerla typically uses beech wood from Franconian forests to smoke its beers, but in this case they use oak for a holiday doppelbock. Traditionally, oak trees were harvested for home and ship building. The brewery says the malt smoked with oak produces a smoother and more multi-layered smoky note than the intensely aromatic beech smoked malt. This doppelbock is a bright copper colors and is 8 percent alcohol by volume. The brewery adds a nice amount of Hallertau aroma hops to this beer. The smoke is round and pleasant in this beer with a good amount of sweet malt for balance. Victory Otto Ale: The back label on this beer explains it was inspired by a 1987 visit to Bamberg by travelers that recently had also visited the Orval monastery brewery in Belgium. Decades later they wondered what impact smoked malt might have on a Belgian dubbel. This 8.1 percent alcohol by volume ale is the result of the pairing of two classic European beer styles. The beer pours a light brown color with a decent tan head. The Trappist yeast strain comes through with some fruit notes and the smoke is mellow and long lasting. The beer is unique and flavorful. Most of the world's truly great wine regions are also well known for great cuisine and artisan food products. Vineyard operations and the entire wine making process fits well with the tenants of the Slow Food movement and its emphasis on utilizing quality locally produced ingredients. 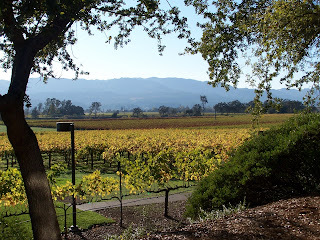 Napa Valley has earned its reputation for producing exceptional wines and the culinary scene across the region is nothing short of amazing. But just like Napa's cult cabs, higher calibre Napa Valley restaurants command breathtaking prices and reservations can be hard to come by during the height of the tourist season. 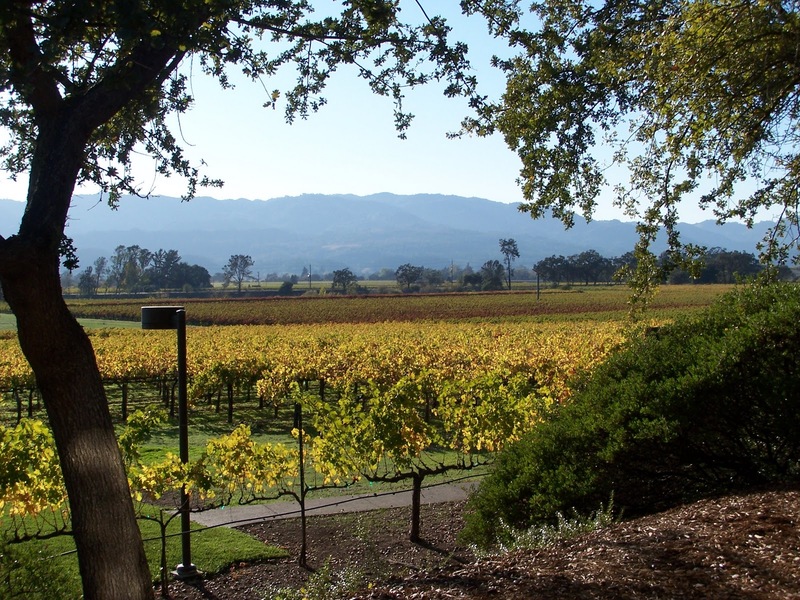 That makes Napa Valley Restaurant Month in January worth considering for a winter wine country escape. Napa Valley Restaurant Month is taking place at more than 58 restaurants and hotels, including Michelin-star recipients the Restaurant at Auberge du Soleil, La Toque, Solbar and Bouchon, along with other notable eateries such as Fish Story, Bottega Napa Valley, Cole’s Chop House, FARM, Brix, Brannan’s Grill and Mustard’s Grill. Napa Valley hotels and inns are also offering special packages so you can turn dinner into a full weekend of touring and wine tasting. Tuesday Tasting is a regular feature of Lyke2Drink that explores some of the best beers, wines and spirits on the market. 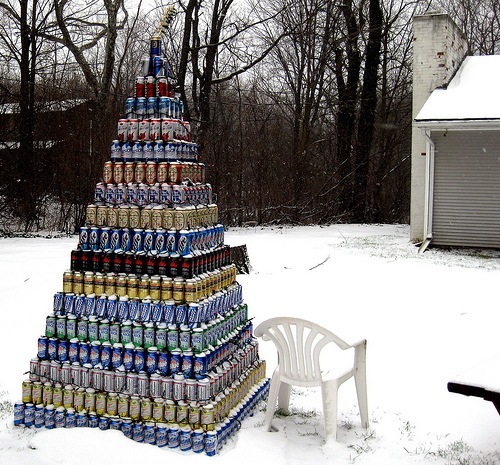 This week we sample a dozen beers worthy of holiday celebrations. A Facebook friend recently asked me if I had a list of my favorite beers for the holiday season. 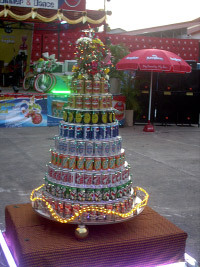 A Twelve Beers of Christmas collection of can’t miss favorites for holiday entertaining and special meals with family and friends. That prompted me to do a little thinking and a bit of tasting. 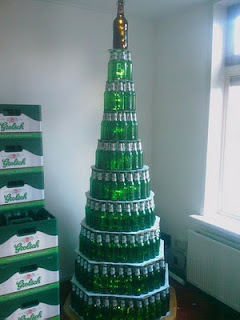 This is my 2011 list of the Twelve Beers of Christmas. I have to admit that I’ve not encountered some of my old favorites (such as Young’s Winter Warmer, Pyramid Snow Cap Ale, Avery Old Jubilation Ale, Saranac Season’s Best Nut Brown Ale, Duck-Rabbit Baltic Porter and Affligem Noel) that might have earned a spot on this list. There is still plenty of time to catch up with these old friends over the holidays, but these 12 beers are worth looking for and sharing with guests. Sierra Nevada Celebration: The 2011 version of this beer is even more flavorful than I recall. It pours a reddish brass color and has a pronounced hoppy nose. From the thick lacing head to the bountiful hop character that carries this beer, it is an American classic. 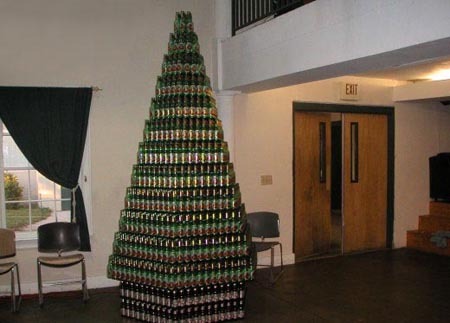 Missing this beer during the holidays would be like not putting up a Christmas tree. Southern Tier Old Man Winter Ale: As a veteran of more than 40 Upstate New York winters I can testify to the need for a warm winter coat and a refrigerator stocked with beers like Southern Tier Old Man Winter Ale. The beer pours an amber brown color with a decent head. The aroma is slightly sweet and the flavor has good balancing hops, malt, maple and fruit notes. You can sense the 7.7 percent alcohol by volume. Rogue Santa's Private Reserve Ale: This copper colored ale packs plenty of hops, but is nicely balanced with a slightly roasted malt character. Rogue has long been one of my favorite northwestern breweries and, even with the amazing growth of craft breweries in the region, Santa’s Private Reserve is a reminder why you want to stay off the naughty list. Trader Joe’s 2011 Vintage Ale: Pound for pound the best value among seasonal beers on the market. At $4.99 a 750-milliliter corked and caged bottle, this beer is made for the grocery chain by Unibroue in Quebec and could easily sell for twice the price. A Belgian-style dark ale on lees, there is a fruit quality to the aroma and plenty of spice character in the flavor. There is a good firm malt body to this beer. I now have four years of Trader Joe's bottles laid down and the 2008 is still very drinkable, so I look for this beer to improve in the next 12-18 months. Corsendonk Christmas Ale: This Belgian ale pours a dark brown color with a moderate tan head. The nose offers some spice notes and a hint of toffee sweetness. Figs, biscuit cookies and brown sugar in the malty flavor profile is balanced slightly by some bitter notes. Plenty of holiday character in this beer. Thirsty Dog Bourbon Barrel Aged Siberian Night: Siberian Night Russian Imperial Stout is a year-round beer from this Ohio brewery, but add some time in an ex-Bourbon barrel and I’ll stack this one up against any Christmas ale or winter warmer. Dark, thick character with plenty of roasted notes balanced by vanilla and Bourbon sweetness. Throw a couple of logs on the fire. 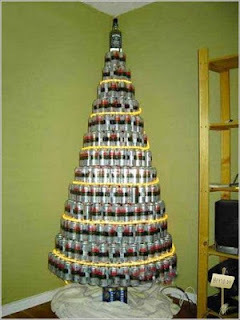 St. Bernardus Christmas Ale: Want to find a great Christmas beer? Try starting with a brewery that makes nothing but great beer. The ale pours a dark and slightly cloudy color, with a decent amount of carbonation. Lots of dark fruit notes, biscuity and spicy. You will want to split the 750 milliliter bottle with at least two friends. Deschutes Jubale: This annual winter release is a dark reddish brown color and offers a malty aroma. This is a true winter warmer. The flavor has a great toffee base, spicy hops and long finish. The beer opens nicely as it warms in your glass. Geary’s Winter Ale: The Maine brewery is one of the original east coast craft beer pioneers, brewing for the first time in 1986. Described on the company’s website as a hearty India Pale Ale, the brewery uses Mt. Hood, Golding & Fuggle hops in this ruby colored ale. But Geary's Winter Ale goes a bit beyond what you would expect from an IPA. There is more malt than you usually find, along with hints of vanilla and a trailing hint of baking spices. Scaldis Noel: This unfiltered Belgian ale undergoes a secondary bottle finishing. The beer pours a reddish brown and has enough malt for two average beers. This is a rich and flavorful beer. Figs, apricot and raisin flavors roll from the glass. 21st Amendment Fireside Chat: This 7.9 percent alcohol by volume brew pours a nut brown color. The solid malt base has hints of cinnamon and nutmeg. Cocoa nibs are used in the brew, giving the beer some extra depth. Anchor Christmas Ale 2011: They have been making this holiday treat in San Francisco for an amazing 37 years. The 2011 beer pours a dark brown color with a thick tan head. 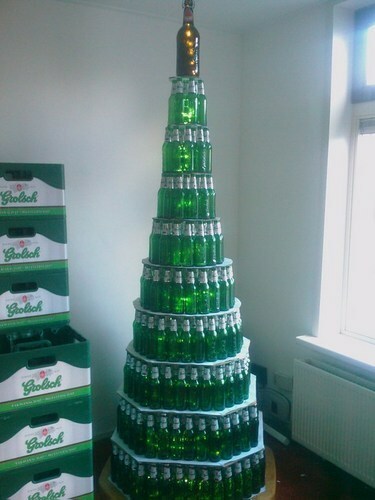 The recipe on this beer changes each year and they keep it a secret. The 2011 is not my all-time favorite vintage, but it is tasty with some nutmeg, cloves and allspice in the profile that includes pine hop notes. Tuesday Tasting is a regular feature of Lyke2Drink that explores some of the best beers, wines and spirits on the market. This week we sample Heaven Hill Distilleries new Red State and Blue State Bourbons. Heaven Hill Distilleries have decided to insert themselves in a fun way in the run up to the 2012 election season with the release of Red State and Blue State Straight Bourbon Whiskeys. These 80 proof Bourbons are designed to give drinkers a chance to show party affiliation. The electronic maps on television news coverage of presidential elections have forever associated "red" with states backing Republican candidates and "blue" with states won by Democrat candidates. As part of the release of the whiskeys, Heaven Hill will launch a Facebook promotion where "likes" between Jan. 3 and Nov. 6, 2012 of either Red or Blue will result in a donation to the USO and its programs offering support to members of the U.S. military. Blue State Bourbon opens with a caramel nose. The whiskey has a new penny color. The flavor starts with a sweet note, but the rich barrel finish takes over. There is a toffee and bit of spice in the finish. Red State Bourbon has a slightly sweet nose with more wood showing through. The whiskey is also a bright copper color. The flavor on this one starts off mellow and there is plenty of oak. Both of these Bourbons are solid, basic drinks. They won't knock your socks off, but at around $15 a bottle they are decent values and good conversation starters. Around the World in 80 Drinks is a regular feature of Lyke2Drink that explores drink culture by visiting the places where great beer, wine and spirits are created and consumed. In this edition we explore Bamberg, a UNESCO World Heritage Site tucked away in Germany's Franconia region. 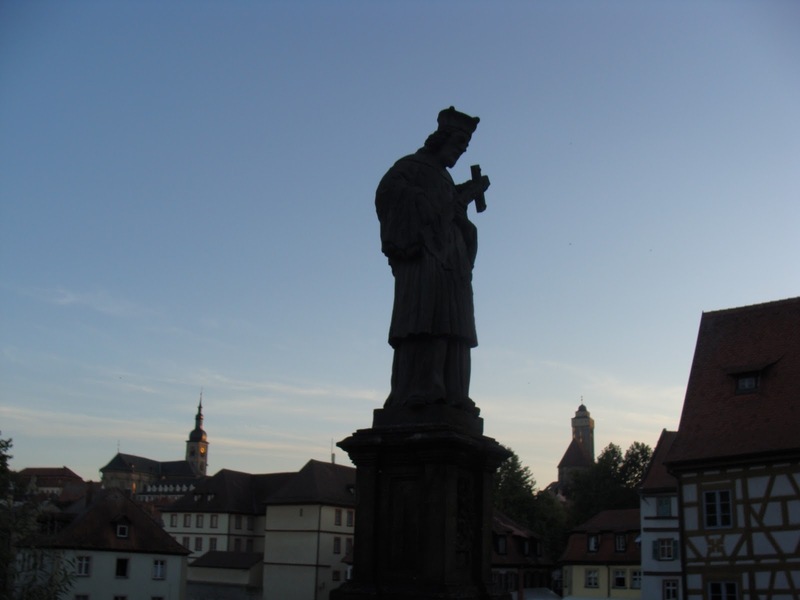 What it lacks in size and big city glitz, Bamberg more than makes up for in charm and beer. Bamberg is a fairytale place with centuries-old buildings that luckily went untouched by World War II. The narrow lanes that criss-cross the Regnitz River climb up and down the seven hills that make up the city. Bamberg is a city known for flavorful beer and food. The city's 70,000 residents have nine breweries to quench their thirsts. If they tire of these, nearly 100 more are in nearby Franconian villages like Memmelsdorf. The brewing tradition runs deep in Bamberg. 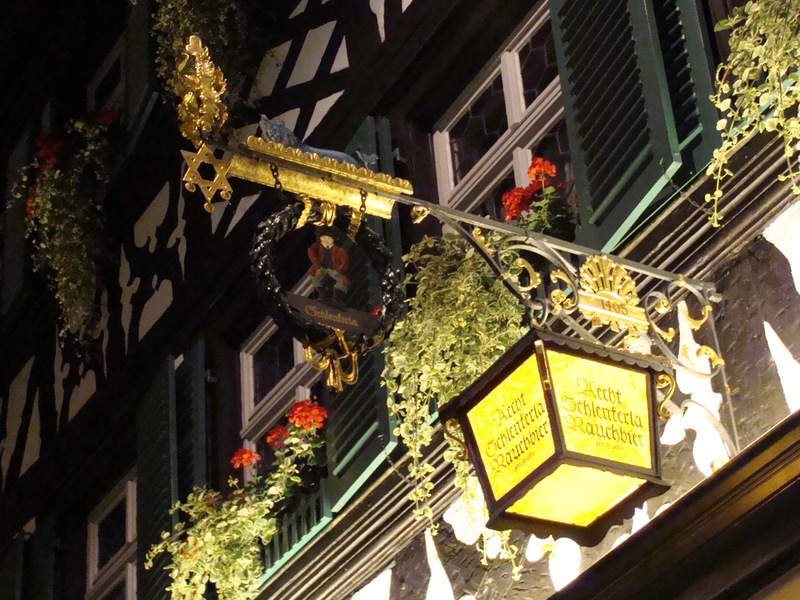 The Reinheitsgobot (Bavarian Beer Purity Law of 1516) is widely recognized, but it was preceded by the Bamberg Beer Purity Law of 1489 dictating that local brewers could use only hops, malt and water to make beer. Prince Bishop Henry III Gross of Trockau had become frustrated by the use of herbs, berries and even mushrooms and decided to take a stand. 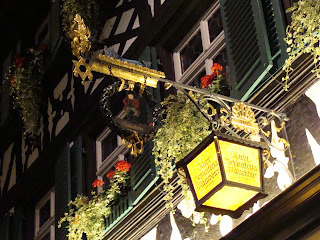 Walking around the ancient city of Bamberg is a delight for photographers. Located to the north of Munich and east of Frankfurt, Bamberg would own a rightful place on the world beer map for brews like Fassla’s Bambergator Doppelbock, Mahrs’ Ungesspundete Lagerbier and Keesmann Herren-Pils, but it is the Rauchbier (smoke beer) that puts this city on every serious beer tourist’s itinerary. All told, there are nine breweries in the city: Ambräusianum, Brauerei Fässla, Brauerei Greifenklau, Brauerei Kaiserdom, Keesmann Bräu, Klosterbräu, Mahrs Bräu, Schlenkerla Brauerei Heller-Trum and Brauerei Spezial. A tenth brewery, Maisel, closed in 2008. Fassla Keller now operates at the former Maisel location. Mahrs is just one of nine Bamberg breweries. Much like Bamberg itself, Rauchbier is taste of history. 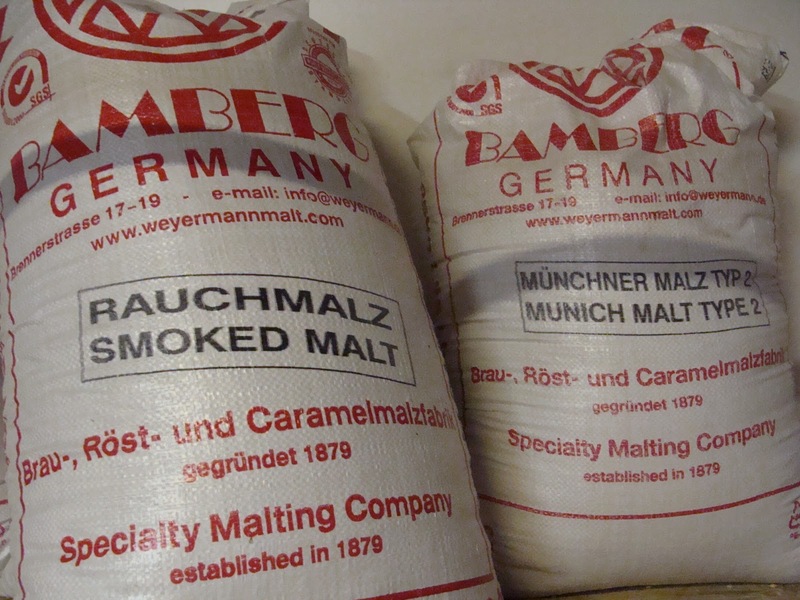 Two of Bamberg’s breweries continue to make Rauchbier and both export to the U.S. Schlenkerla, home of the world famous Aecht Schlenkerla Rauchbier, and Spezial, which dates back to 1536, both use beechwood fueled fires to create a mellow smokiness to the malt. 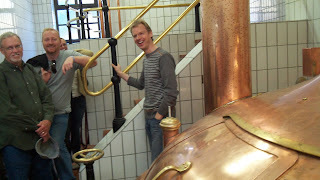 A visit to either Schlenkerla or Spezial is a classic German brewery tap experience. Unlike the massive beerhalls of Munich, these multi-room locations feel more like a friend's home. Entering from the street into a wide hall, you open a second door that brings you inside the tavern. You will not find a traditional bar. Instead, you will be taken to one of a series long tables and there you will join strangers already enjoying beer or in the middle of a meal. This feels odd the first time you do it, but that soon passes as you get the feel for the Bamberg beer culture. A busy bartender is visible at a service bar, expertly pouring half liter “Willy” glasses, and waiters and waitresses fill trays, whisking them to the tables. The Spezial Keller is a great place to rest and hydrate after a walking tour of the city. In warm weather months outdoor drinking is popular in Bamberg. 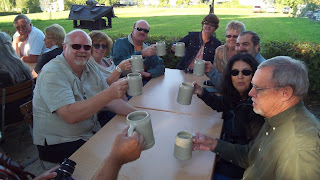 Bierkellers or Sommerkellers are tree-shaded affairs that make for pleasant gatherings with friends. The Spezial Keller is an 800-seat beer garden located high on a hill, oddly not far from where the rival Schlenkerla in brewed. The Greifenklau Brewery also has a wonderful outdoor terrace that overlooks the red tile roofs of Bamberg. 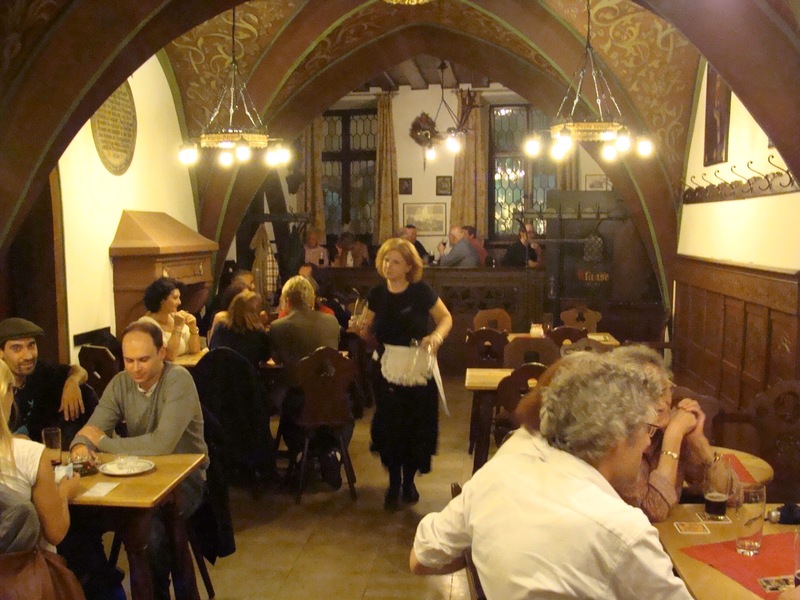 Service at these locations can be a bit slower than at the pubs in Bamberg, but relax. Half the experience is slowing down to enjoy the beer, view and atmosphere. Bamberg is known to many brewers in the U.S. because it is home for Weyermann Specialty Malt. The company traces it roots back to 1879 when it was little more than a roasting drum under a tarp. Today the massive maltings, located across the railroad tracks from the Bamberg station, is a complex of buildings. The company ships specialty malts around the world. 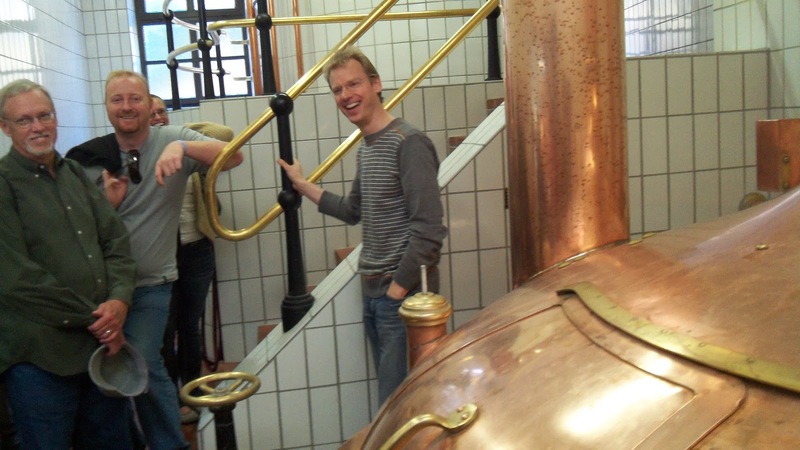 The Bamberg facility has a test brewery where lucky visiting guests get to taste pilot batches of beer. Smoking barley for rauchbier is a different process than roasting barley. Roasted barley is what gives beer some of its flavor and produces the dark color in stouts and porters. The roasting process halts germination, which makes sugars available to the brewer. Roasting barley, which is similar to roasting coffee beans, is done with indirect heat at higher temperatures. The smoking process purposely allows flavors from wood fires to infiltrate and impart flavor. Weyermann Specialty Malt calls Bamberg home. The Schlenkerla sign is a beacon for many beer tourists. The Schlenkerla pub retains its traditional feel. If you wonder what beers tasted like before the mid-1800s, you can search for clues of brewing’s smoky past in a glass filled with a Rauchbier. To be used for brewing barley must be turned into malt and that germination process must be halted at just the right time. In the past brewers had really two options: spreading the grain and allowing either the air, wind or the sun to help dry it, or employing open flames fed by wood to assist the process along, much like Scotch distillers us peat. Schlenkerla Rauchbier: This 5.1 percent alcohol by volume Bamberg classic is dark amber with a thin, but lacing head. Light and refreshing, it offers immediate smoke up front that lingers throughout. Schlenkerla Urbock: This fall seasonal tastes slightly less smoky, with more hop character and more malt. This 6.5 percent alcohol by volume beer has a sweet alcohol edge. Spezial Rauchbier: Amber brown color, this brew has a soft malty character and its subtle level of smoke leads you to think of having a second. “Rauchbier is historic beer. Beer as it used to be,” says Matthias Trum, the sixth generation of his family to run the brewery where Schlenkerla is made. Trum says that today’s smoked beer is a throwback to the middle ages when brewers did not have access to the heat exchangers developed during the industrial revolution. The best air connections from the U.S. will take you to Frankfurt or Munich. German trains are fast, clean and convenient. You can be drinking a rauchbier in just about three hours after landing in Germany. 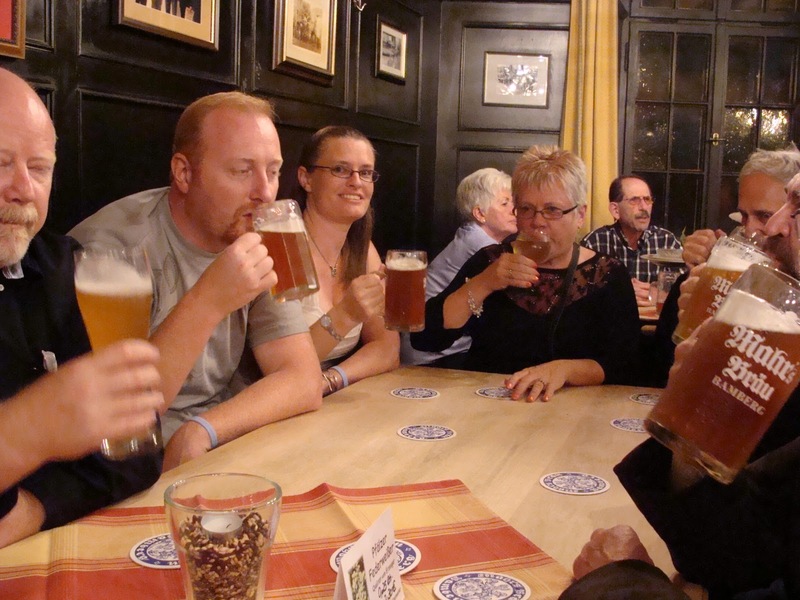 The Bamberg Tourism and Congress Service has packages designed for beer lovers. 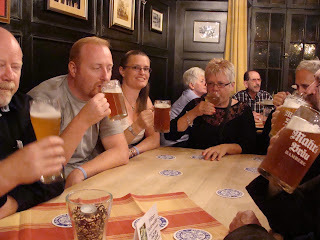 They also can arrange for guides with a great knowledge of local history and familiarity with Bamberg’s brewers. A number of tour groups also make stops in Bamberg. I recently lead a group organized by BeerTrips.com on a visit to the city as part of a fundraiser for the Pints for Prostates campaign. You will not find the usual glut of chain hotel in Bamberg, where most lodgings are small family-run operations. Hotel Brudermuhle at Schranne 1 is located along the river and a short walk from some of Bamberg's best places to grab a beer. If you want to stay even closer to the beer, Fassla Brewery at Obere Konigstrasse 21 has basic rooms right above the brewery and beer hall. It also happens to be located directly across the street from Spezial. Visit the Franconian Brewery Museum which is located in the former Saint Michael's Benedictine Abbey overlooking Bamberg. The former abbey, now a home for senior citizens, once had a brewery dating back to 1122. The museum has a great collection of earlier brewing equipment, signs and other memorabilia. Eat a Bamberg Onion. Like Rauchbier, this baked onion stuffed with ground pork and spices, is a flavorful treat you will not find in many other places. Here's a Bamberg Onion recipe if you would like to try making them at home. Take in the four tower Bamberg Cathedral, which was consecrated in 1237. It is the final resting place for Emperor Henry II and Pope Clemens II. Among the art in the cathedral is the Bamberg Rider. Find your sweet spot at the Cafe am Dom on Ringleinsgasse, which makes a great chocolate filled with a Schlenkerla Rauchbier creme. Walk the city with your camera looking for the perfect Bamberg photo. 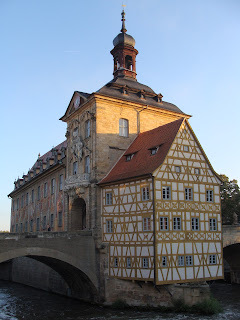 For many it is the Bamberg Rathaus (old city hall) that was built literally hanging off a bridge. For others it is the rose garden at the Prince-bishop Friedrich Karl von Schönborn residence across from the Bamberg Cathedral. You will come back with plenty of great photos. Bamberg's narrow streets are great to roam. Fassla offers guest rooms right above the brewery. Matthias Trum runs the famous Schlenkerla Brewery. Spezial Rauchbier is a local treat. 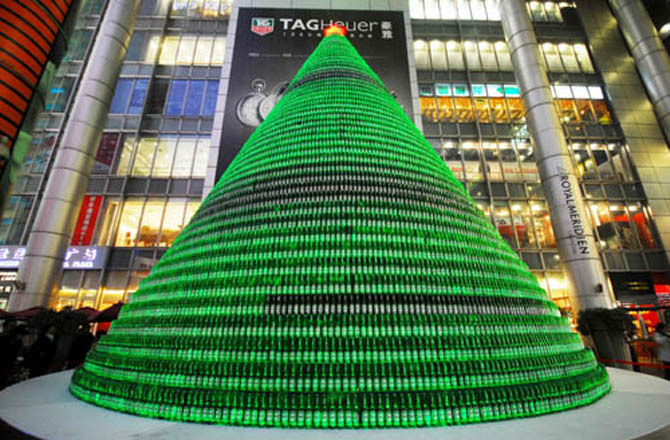 What Will Santa Leave Under Your Beer Can (or Bottle) Christmas Tree? 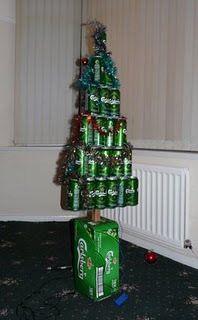 I'm sure Martha Stewart and my interior designer wife, Sandy, would would throw disappointed glances in the direction of these crafty beer drinkers, but in our current hard economic times let's face it: the cost of a fresh cut Christmas tree is just not in the budget for many Americans. You can still get into the mood of the holiday season and all you need are the contents of your recycle bin. 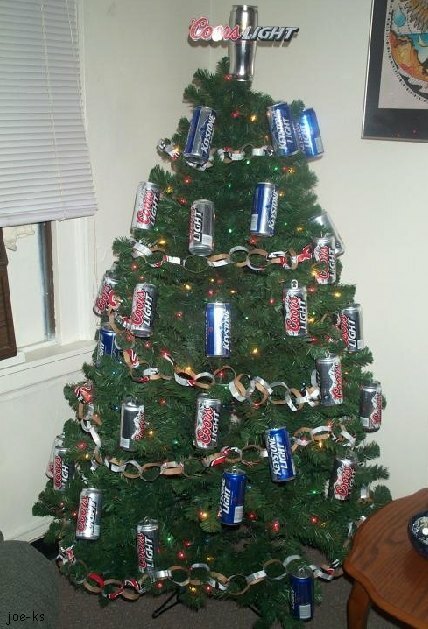 Lyke2Drink has chronicled beer can Christmas trees in the past and felt like it was time to revisit this timeless holiday tradition. Obviously, the elves behind these creations have differing points of view on key design elements. 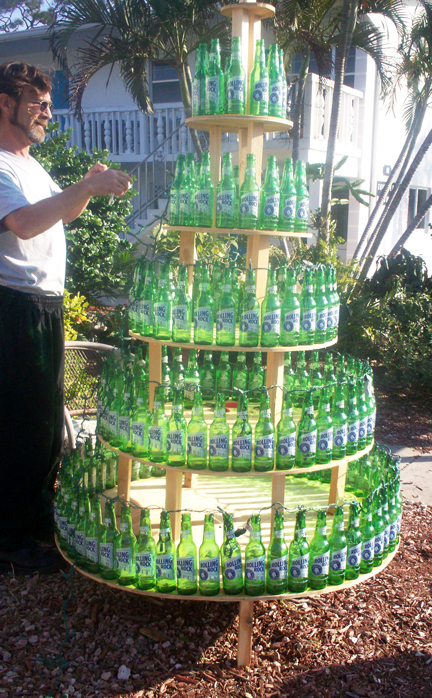 Some prefer bottles, while others go for cans. Some are devoted to single brands, while others are a bit more flexible and like to experiment with color. 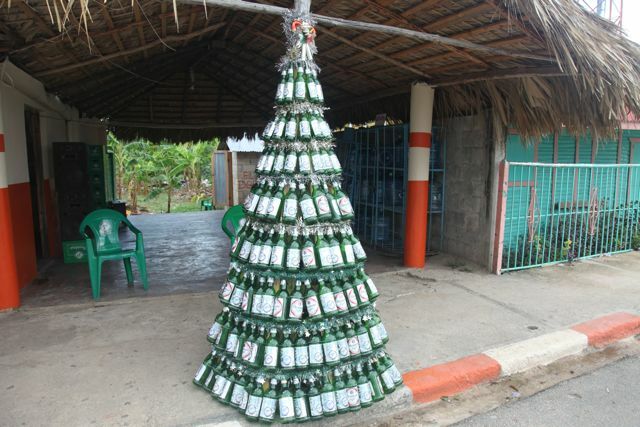 Here's wishing you a happy holiday season. Now get drinking. That tree just won't grow on its own. Tuesday Tasting is a regular feature of Lyke2Drink that explores some of the best beers, wines and spirits on the market. This week we sample Highland Park 18 Year Old Single Malt Scotch Whisky. Highland Park is recognized by many as one of the top Scotch brands in the world and rightfully so. The range from the Kirkwall distillery is delightful from bottom to top. The distillery has been turning out whisky on the Orkney Islands since 1798. Highland Park 18 Year Old Single Malt pours a light golden color. First added to the line up in 1997, the nose has a bit of wood and a whiff of smoke. The flavor is full and bright. There is a honey sweetness overall, nice hints of salt and wood, with a smooth peat smoke finish. This is a very nice sipper and at $105 a bottle a great gift for a special Scotch fan.